To mark the upcoming MCB- Staysure 2018 Tour in Seychelles, the Seychelles Tourism Board (STB) joined the Seychelles Golf Club and its team of young golfers for their last “Tee” for the year 2018. The activity was held at the Anse aux Pins Golf Course on Tuesday November 27, 2018 and saw the participation of a total of 24 children partaking in the golfing activities to end their golf classes for the year. 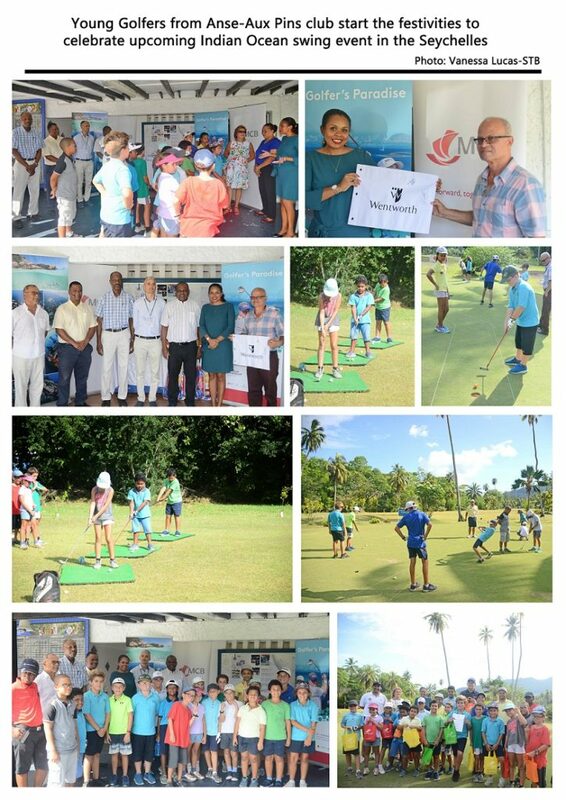 The activities organised by the Seychelles Tourism Board in collaboration with the Seychelles Golf Club and the Mauritius Commercial Bank (MCB) Seychelles. During a short ceremony, STB Chief Executive Mrs. Sherin Francis mentioned her satisfaction to have Seychelles host its first international golf tournament and expressed her delight to share such an important moment with the young golfers. “Our younger generation is our future, we wanted to start our countdown to the MCB- Staysure Tour event in the Seychelles by including our young golfers who I am sure are eagerly looking forward to following this first tournament, ”said Mrs. Francis. Retha D’Offay golf Club committee member started the young Golfers club, she explained that golf is considered old men’s sports and that she wanted the golf community locally to have more young members. “When I started this activity, I wanted to help kids have fun learning the lifelong game of golf and encourage family interaction that builds lasting memories as most children playing here have their parents,” said Mrs. D’Offay. The STB Chief Executive also took the opportunity to present to the Seychelles Golf Club President Mr. Alix Esparon the Wentworth pin acquired from the launching event in May 2018 in Surrey, during which it was announced that 2018 Staysure Tour season will end in the paradise islands of the Seychelles. The Wentworth pin has been signed by two current golf celebrities; Belgian professional golfer who plays on the European Tour Thomas Detry and Martin Kaymer, a German professional golfer who also plays currently for the European Tour and the PGA. After the official formalities, the 24 young golfers carried out their small competition under the supervision of their coaches William Weidner and Yves Emond. A small prize giving ceremony closed the event; the Golf Club coaches rewarded the best performers and all 24 players received a token from STB and MCB as part of their participation to the activity.